This is quite outdated, kept only to remind me of how embarassing my earlier work was! This was the first project I worked on that involved a team that was international, with the client, consultant, graphic designer, and photographer in different countries in Europe. When I was approached the team had the layout, but wasn’t sure how to implement it. Over the course of a few weeks and about 60 hours the first “version” of the site went live. I decided to utilize WordPress, however instead of a blog platform I re-purposed it into a dynamic CMS to make updating and managing the content on the site easier. This project’s “first phase” was finished in the latter half of 2009, however because no website is ever really complete I’ve continued to work on it since then, performing minor tweaks, fixes, as well as big updates. One of those updates happened in the middle of 2010 with the addition of new content and the need for some changes around the site. After the work on the main site finished up St.Clair wanted a new “private” website that he could use to post content and updates on his own to a select group of individuals. The goal for this project I felt was to keep it simple (as is my philosophy) so that it would be easier for St.Clair and others to post content, but also keep it secure from uninvited guests. This was an interesting project because many of the design guidelines for a website weren’t applicable, as it is never intended to be open to the public so some of the standard SEO related “tricks of the trade” weren’t necessary. Again I utilized WordPress for this project — it’s simple to use, and it’s simple to set it to private and only allow subscriber’s to view the site itself. Work on this project went relatively quickly, as many of the assets were already there, but minor fixes and changes are needed on occasion. Work on this project coincided with the major update to the main site. The total time spent on this project was 10 hours, however I don’t count tweaks or fixes after the site went live. Because of the nature of the site itself I cannot link to it, however the design is very similar to the main StClair site except I changed the original layout to be more blog-like. Not even I remember the exact number of versions my personal website has gone through over the years. I’ve owned the domain for a very long time, and it’s been many things. One of my favorite designs involved “moogles” and an angular/space theme, one of the original layouts I recall was very teal, and for awhile I dabbled on the “light-side” of things (coming to the conclusion that I don’t much like it personally). This new layout, the one you see today, came about because of my wish for something that was truly personal — something that I liked, rather than something built for “someone else” (whoever this someone else is I don’t know). You see I felt like I wanted to “take back” my website, make it my own again. This project went very quickly, over the course of a week or so and about 10 hours total when all was said and done. It took me awhile to finish styling the comments and archive/catagory pages due to the fact that I was working on StClair’s websites (from above). The goal for this design was to include a clean header that would randomize on each page load (pulling from a pool of graphics from things I enjoyed such as movies, shows, books, games, etc…), and to give off a clear “tech” vibe. It also had to be blue (blue is awesome). This design also marked a change back to the black background and lighter text in the foreground, I decided I just didn’t like the harshness of a white background. The backend of Kupatrix is also WordPress (do you see a pattern?) along with a very small number of plugins. I’m still debating whether to serve ads or not, as such the design currently doesn’t show where they would be. As an offshoot to Kupatrix I created, briefly, a website that was to serve as a portfolio “professional” face to my design services. I was never entirely happy with it, but the design was rather clean. I took it off line awhile ago as it wasn’t serving the function I wanted it to. I was also hesitant to use “I” for some reason — today I’m proud to say I’m a geek of all trades, yes it’s just me! But I’m damn good. Blizzforums is a fansite for Blizzard Entertainment, the company behind popular games like World of Warcraft, Starcraft, and Diablo. The site itself has gone through many changes over the years, but one of them was definitely not it’s layout. Blizzforums had used the same layout it had since it switched to vBulletin about 5-6 years back I believe. At any rate it was due for a facelift. You might ask how I became involved in such a project, well the truth is I “hired” myself! I was put in charge of Blizzforums back when the other Administrators decided to focus on other endeavors, and I stepped in willingly, as it was the first community I joined when I was a kid and I credit it for much of what I’ve learned over the years due in part to the intelligence of some of the members. At any rate the project to “Remix” the layout took longer than most of my projects because I was determined to iron out any bugs or glitches before switching over, as such I put together a group of random members (from new to veteran) to get feedback from and help test the new layout. You can view the old layout by visiting the Wayback Machine and selecting one of the later dates, however many of the graphics appear to not work anymore. The new layout utilized many similar visuals from the old layout, but because no one had access to the original Photoshop files, I had to remake, remix, or create new graphics for each area including the header, footer, postbits, and various other minor graphics such as gradients, icons, etc… This project wasn’t difficult, but it was complex. If I missed one icon when switching over, it would break the feel of the design! The new design is still in “service” today with a few additions: We added a “portal” to the fansite, so as to post news and the like, this required more graphics work and a rather ingenious (I humbly submit) use of “CSS Sprites” so that the graphics used for to border the blocks on the portal are all one big GIF image rather then split into 12 individual images. The new design also has a much simpler postbit, and utilizes a much broader grey/blue gradients and colors than the previous version did. The result of this project was a smashing success, aside from a few malcontents, everyone liked the new design. I should also mention that because of my ongoing “position” on Blizzforums the “project” is ongoing and goes beyond simple website design, as I also have to mediate disputes, watch for and fix glitches, tackle spammers, and plan for the future of the site and community. This is an older project, but one I rather like because of the simple layout. This was a project done for a close family friend to help and try to organize her (rather atrocious if I may say so) previous website’s “design”. Today it’s somewhat dated and I intend to revisit it in the near future and help give it a facelift and help integrate it into the other areas where Beki is active such as twitter and such. If I recall correctly this site runs on a small CMS from a coder who I’ve long since forgotten. ORG Wiki – A community project I started “unofficially” and was eventually moved to the ORG Network site. This wiki serves as place of history, information, and trivia associated with the Blizzforum, Warboards, Starcraft2.org, and SCLegacy communities. My work on this project included managing a Mediawiki and customizing the style to match Warboards, which at the time was a white/grey type layout. Warboards.org Banners – On a whim I decided to help out and design some new banners (and expand my photoshop skills) for the Warboards.org community fansite. You can view some of these headers here (note that these weren’t the final version). These were used until changes were made to the site that eventually led to it’s repositioning as the Starcraft.org Forums. Kupax.com – Kupax is my free file hosting service. When I first bought hosting back in about 2003 or 2004 I setup scripts and the like to help people host images for free, because at the time there was no simple alternative and many forums allowed signature images, but didn’t host them locally. Kupax is the continuation of a file hosting service I ran at up.kupatrix.com. This project is only marginally “mine” in the sense that I customized some of the theme and layout, but for the most part it’s a self-contained and rather elegant script from a talented coder. 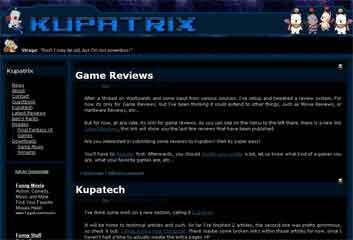 Kupatrix.net – This domain is currently empty, but in the past has served as a testbed of projects and the like. Currently I offer friends hosting under this domain, to keep them separate from my main dot com. This isn’t so much a project as a service, but for completeness’s sake I decided to list it. RayMaterson.com – I’m actually proud of this project, aside from my note above, as well as it’s sister site. This project was put together to feature work from the Embroidery Artist Ray Materson who is also a book author and speaker. This was a very fun project to work on simply because of the cool-factor involved in Ray Materson’s needlework. This site uses a very rudimentary form of dynamic CMS. However it’s not a total negative because when you don’t rely on complicated setups you can maintain full control over the layout. EmbroideredPortraitsbyRay.com – This is a sister site to Ray’s main site. This was a small project put together as a way to inform people of Ray’s services as an embroidery artist. 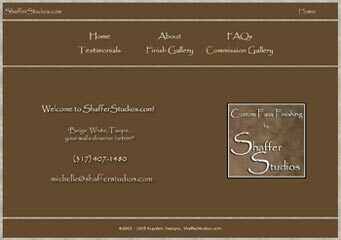 ShafferStudios.com – This was a website for Michelle Shaffer a central Indiana Fuax Finish artist. It was rather basic in it’s implementation, but it was fun to work on as well, given her beautiful work. I’m unsure as to what happened to the site, but you can view it in the Wayback Machine at the Internet Archive. After the original version we revisited it and changed the layout again. All I have left is screenshots, however. Angel’s Faux Walls – This was a website for a Faux Finish artist friend of Michelle Shaffer’s, and again all I have is a screenshot. Both Angel and Michelle’s websites included work with a large number of photos, at the time I wasn’t as adept at handling them as I am now but I muddled through somehow. Both of these projects were interesting to work on because of the artistic nature that had to be conveyed through them, as well as a way to present to interested parties their Faux Finish abilities. 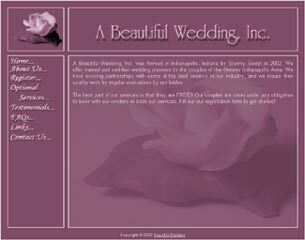 A Beautiful Wedding, Inc – This was a Wedding Planner site for my cousin. It was very pinkish.